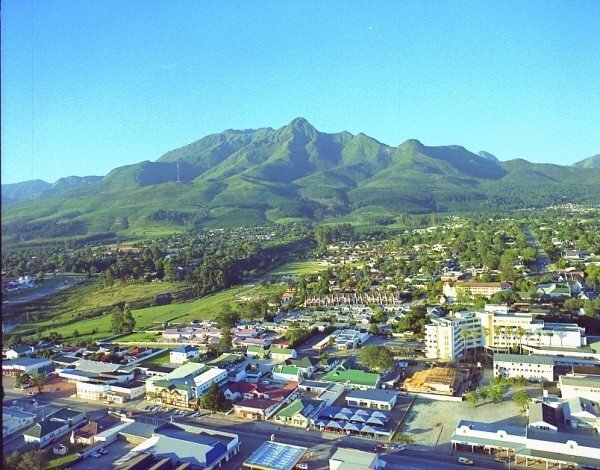 George in the Garden Route is the oldest and central city as well as industrial hub of the South African Garden Route. George is approximately 15Km inland and lies in close proximity to the majestic Outeniqua Mountains. The mountain tends to affect weather patterns and humidity levels. Suburbs close to the mountain experience more humid conditions than those further away. In general George temperatures are slightly lower than neighbouring towns Knysna or Mossel Bay. The close proximity to the mountain, which tends to bank cloud formations also affects temperature and rainfall. The affect of the mountain and close proximity to the coast tends to alter weather patterns pretty rapidly and this has resulted in a colloquial phrase commonly used by locals in George, which is "if you don't like the weather in George, come back in 10 minutes". The town has a mediterranean maritime climate, with moderately hot summers, with mild to chilly winters. George boasts one of the richest rainfall areas in South Africa. Rains usually occur during the winter months, which are brought on by the humid sea-winds from the Indian ocean. As a general rule the Southern Cape & Garden Route's temperate weather falls between two climatic regions of summer and winter rainfall, which results in rain falling mostly at night, which tends to keep the area perennially green. Summer is considered to be between the months of November to March, which are warmer, with December to February seeing mid-summer with daily temperatures ranging between 24-30ºC. February - March usually sees strong berg winds, which on odd days reach a peak where temperatures rise to as much as 38ºC . Winter runs through June, July and August. Temperatures usually fluctuate between 8-17ºC. In general the barometre seldom drops below 10ºC . Most days are warm with evenings colder.